All Meals are prepared fresh in our kitchen and served in the rooms or in the breakfast room. the kitchen is operational all 24 hours. Engaged in providing services such as breakfast facility. 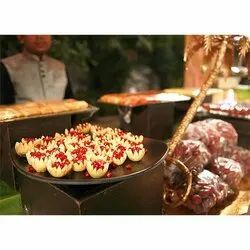 A rich personal profile (served for 15 years in reputed 5-star hotels like Le Meridien, Hyatt Regency, Taj Group, ITC hotels ltd) and professional expertise, in a very short span of time helped us in bagging some of the most prestigious catering assignments in the city.